Today I want to share with you what I do with all my graded papers. To see how I collect papers, stop over to Pamela's blog where I guest blogged about this very thing (I forgot to post about it because it was chaotic last week). Tara over at Fourth Grade Frolics posted about her paper organization and it got me thinking, I think (in my world) I have a pretty good method so why not share it? 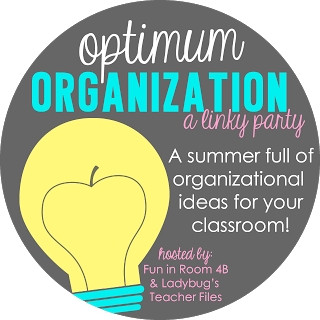 So, with that, I am linking up with Elizabeth and Kristen for their Organization linky. Once a stack of papers is graded and put in number order (you will see the importance of this in a minute) I take them over to my super snazzy "mailboxes"
Yep you are looking at that right. I use a shoe organizer for my mailboxes. I am cheap frugal and refuse to spend tons of money on class mailboxes. This was $20 and has been holding up just fine. 5 years and no issues other than it being dusty. Each box has a number and I simply take my stack of papers and stick them in the slots. By the 2nd week of school I know every child's number so I can easily tell if someone hasn't turned a paper in and I just skip their box. On Wednesdays we send home "Wednesday Folders" (original right?) which include graded papers for the week, important papers from the office, etc. 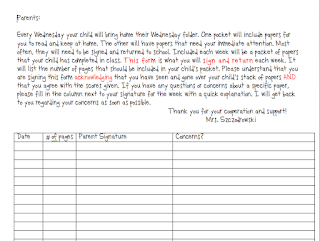 Depending on my support schedule, either Tuesday afternoon or Wednesday during a break or lunch, I go over to the mailboxes, grab the stack of papers from each child's box and staple them together, then put them in their Wednesday folder. Where are their Wednesday folders until this point? In their mailboxes of course! On Thursday, when students return their folders (with signed papers- more on that in a minute), I empty them out and put their folders right in their box. This way I can easily see who has not returned their folder. Ok back to my routine- then throughout the day we will get things that need to be sent home. Depending on how much there is and how much time I do or don't have, sometimes I simply pass out the folders to the kids and then one sheet at a time and tell them which pocket to put the papers in (return to school or keep at home). 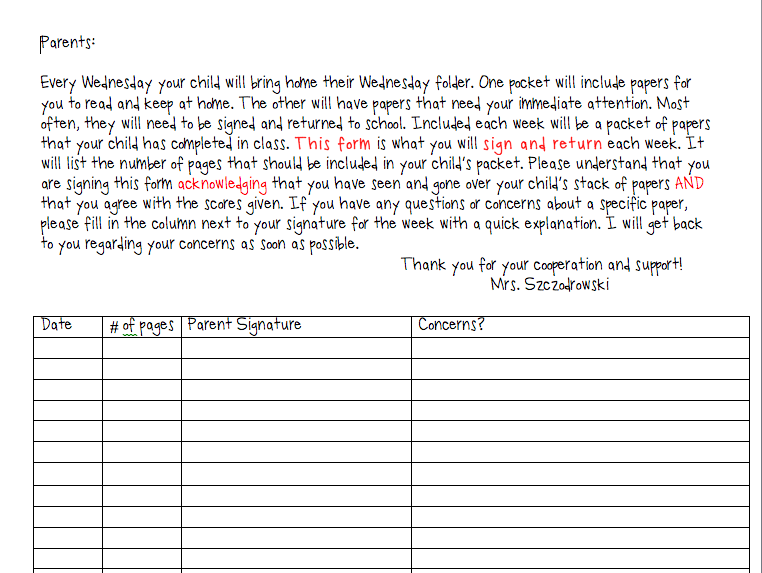 Because I want to cover myself in any possible grade discrepancies, the parents must sign a form and send all graded papers back to me. I know I know- that is a lot of paper to save. Yes it is. But it is better to have it and be covered should you need it than to be at a loss (or even to have it if you have an IEP meeting on a child). and bring it and their papers back. It is very simple for me to check now. Kids throw their folders on my table in the morning on Thursday and during announcements I put them in number order and start emptying them. Papers for the office in one pile, graded papers in another. (This slip just stays in their folder at all times). (Notice is says # of pages- yes I have had kids pull out the bad grades and hide them- this helps prevent that.) I put the folders back in the mailboxes and then file away their graded papers. Last year I used hanging file folders in a filing cabinet, but I have to admit, I really like Tara's crate a lot better. I may have to do that this year. If I run out of time (I really try to get this all done by the time breakfast, announcements, and morning work are over) and can't file papers, I stack them in a pile and try to get to it later. Sometimes, I don't. And when the pile gets too large for me to handle, I let some of my helpers take the papers and organize them by student. They simply make a pile for each student and put them in number order for me. Then I just file them quickly. At the end of the semester, once report cards are home, signed, and returned (yes those have to be returned too) I send home ALL graded papers, making room for the next semester's work. The ONLY time I don't is if I think I will need to refer a child. I keep all of their work. The key to all of this is keeping everything in number order. Graded papers so that you can quickly throw them in the mail boxes. Wednesday folders on collection day so that 1. you can quickly throw them in mailboxes and 2. Graded papers are in order for you to quickly file. If you have any questions, let me know! This system has been working great for the past 5 years (well really 4 I suppose...my first year I would bring home tons of papers to organize). What a wonderful post! I have a similar procedure for graded papers. I used to send all of their graded papers home, have the parents initial each page, and then have everything returned. However, when I moved to my new school, I had little filing space, so I only asked for a form to be signed and returned acknowledging they saw all of the papers (similar to the one you showed). I love the idea of filing the papers in crates until the end of the semester though! What a perfect idea to save space but still have all of the "evidence" of student grades! Hope you don't mind if I steal that idea. Thanks for sharing! 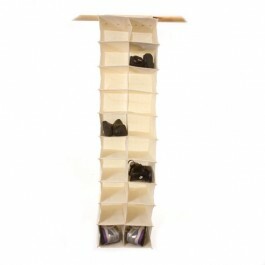 I like the idea of using a shoe organizer. I love using class numbers but the last two years I have had a number of students leave, start or leave and then come back during the same school year that our number system gets all messed up. Fingers crossed it will work out again next year. Thanks for giving so much detail on how you organize all the paperwork! One thing I do to get the papers in number order right away is have them line up with their paper and I collect them one by one that way. Of course this only works for things like tests that I collect all at one time. It gives the kids a chance to get out of their seat and move around too, which is nice. Wow, Gina. You and I were cut from the same exact mold. Not kidding. Well, except that my folders are "Thursday Folders". The only other thing that is different is that I don't have the shoe hanger as my "mailbox". However, you've got me thinking! Thanks for linking up with us!